When we look to the past to better understand our world, we often seek the historical documents and correspondences that shaped our governments and their institutions. Yet, romance also left behind letters that continue to shape our understanding of not only the world as it once was, but of our shared humanity. 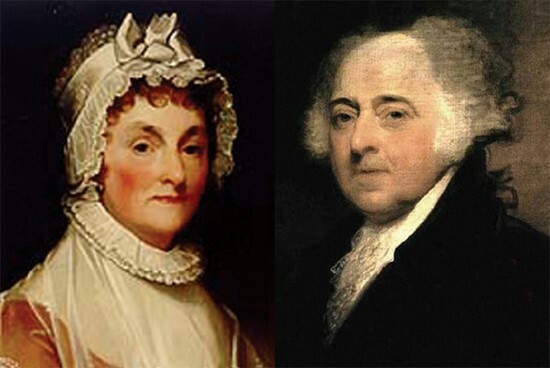 John and Abigail Adams began their courtship in 1762, several years before the birth of the United States. The couple enjoyed using pen names with one another, John addressing Abigail as Diana, after the Roman goddess of the moon, and Abigail calling him Lysander, after the Spartan war hero. (Facts from http://www.pbs.org/wgbh/amex/adams/peopleevents/e_courtship.html) By the end of John’s political career in 1801, he and Abigail had exchanged over 1,100 letters. Though the couple spent considerable time apart, their correspondence acted as a reminder of their dedication to one another and allowed for a rigorous intellectual exchange pertaining to the pursuit of a democratic nation. In perhaps one of Abigail’s most famous letters to John, she showcases her both her assertiveness and commitment to democratic values as she reminds him that he needs to “remember the ladies” in an age where women were taught to remain in the domestic sphere. Tho we felicitate ourselves, we sympathize with those who are trembling least the Lot of Boston should be theirs. But they cannot be in similar circumstances unless pusilanimity and cowardise should take possession of them. They have time and warning given them to see the Evil and shun it.-I long to hear that you have declared an independancy-and by the way in the new Code of Laws which I suppose it will be necessary for you to make I desire you would Remember the Ladies, and be more generous and favourable to them than your ancestors. Do not put such unlimited power into the hands of the Husbands. Remember all Men would be tyrants if they could. If perticuliar care and attention is not paid to the Laidies we are determined to foment a Rebelion, and will not hold ourselves bound by any Laws in which we have no voice, or Representation. Every one of your Friend[s] send their Regards, and all the little ones. Your Brothers youngest child lies bad with convulsion fitts. Adieu. I need not say how much I am Your ever faithfull Friend. There is truth in saying that the power of the written word continues to challenge and mold our conceptions of what love is. 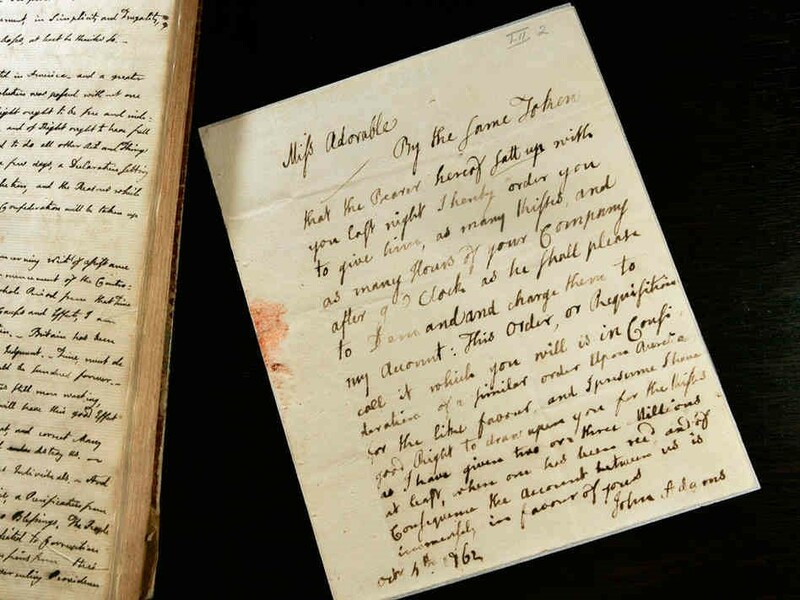 The correspondence between John and Abigail Adams showcases a unique egalitarianism that existed in their relationship—it was that egalitarianism that they had hoped would one day transcend their letters into what would become American democracy. On our quest to learn everything about 1878, when Dempsey & Carroll was founded, we came across these beautiful stamps from the late 1800s. We wish these were still around! Designer: Butler Packard · Vignette: Joseph P. Ourdan · Frame: Douglas S. Ronaldson · Lettering: D. S.
Although scientists Pierre and Marie Curie are most well-known for their discovery of the radioactive elements polonium and radium, the story of their romance is one that continues to echo outside the scientific community. Marie, originally from Poland, met French physicist Pierre when she came to Paris to pursue her studies in the physical sciences and mathematics at the Sorbonne. We have promised each other — haven’t we? — to be at least great friends. If you will only not change your mind! For there are no promises that are binding; such things cannot be ordered at will. It would be a fine thing, just the same, in which I hardly dare believe, to pass our lives near each other, hypnotized by our dreams: your patriotic dream, our humanitarian dream, and our scientific dream. Of all those dreams the last is, I believe, the only legitimate one. I mean by that that we are powerless to change the social order and, even if we were not, we should not know what to do; in taking action, no matter in what direction, we should never be sure of not doing more harm than good, by retarding some inevitable evolution. From the scientific point of view, on the contrary, we may hope to do something; the ground is solider here, and any discovery that we may make, however small, will remain acquired knowledge. 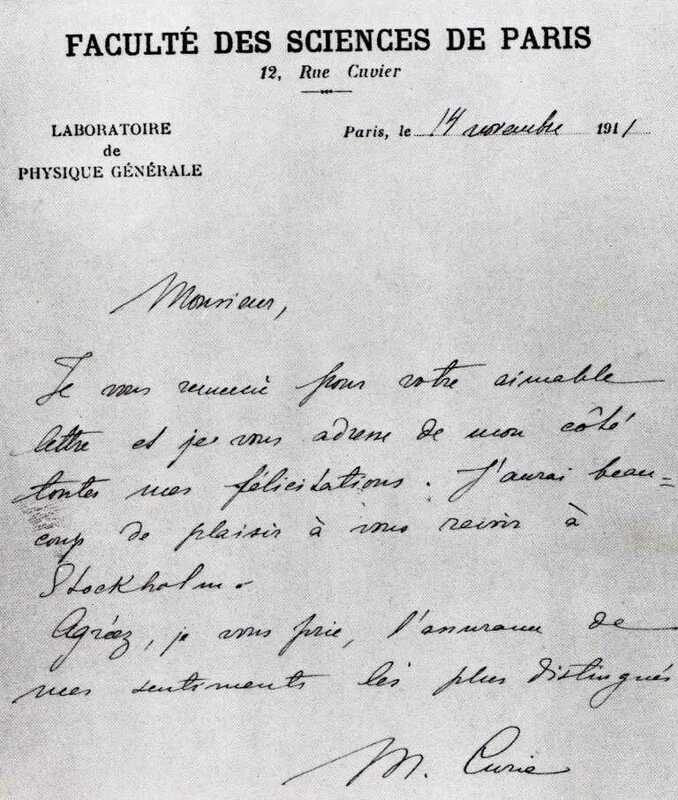 A letter from Marie Curie to one of her colleagues at the Sorbonne (Image courtesy of: http://atozhandwriting.com/marie-curie/). Sometimes one can best express his or her thoughts in writing. In our writing, we are candid, allowing our emotions to flow into the pen and onto paper. It is through this letter that he expressed to Marie that which he wished to articulate to her—that not only does he adore her, but he regards her as his intellectual equal. The couple married in 1895 in Sceaux, France. In an era when men and women were expected to abide to society’s gender roles, Marie and Pierre worked together as a team, imagining a world where their scientific contributions bettered society. 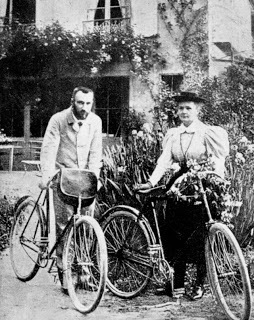 Shortly after Pierre was killed in an accident in 1906, a devastated yet determined Marie vowed to continue the work she and Pierre began. The Sorbonne appointed to her husband’s academic position, making her the first female professor at the university. Marie went on to become the first woman to win the Nobel Prize, an achievement rooted in the couple’s work together. Today, there are infinite possibilities of how couples come to be. Here at Dempsey & Carroll, our passion is paper, and we would love to learn about your own personal love story and the letters and notes exchanged that helped to cultivate that love. If you are interested in sharing your story on our blog, please email madeleine@dempseyandcarroll.com. Imagining a Better World in Letters: Remembering Martin Luther King, Jr.
Today we celebrate Martin Luther King, Jr.’s legacy of equality and civil disobedience. King’s vision of a world in which one is judged for her character is one that continues to inspire people in all walks of life. There is no doubt that he understood the power of the written word, as exemplified by his handwritten drafts of speeches and letters to family, friends, and fellow activists. A letter that King wrote to his secretary Maude as he concluded his stay in India. Photo courtesy of End Paper, The Paperblanks Blog (http://blog.paperblanks.com/wp-content/uploads/2014/01/Martin-Luther-King-Jr-I-Have-a-Dream-Handwritten.jpg). Be sure to check out more of his letters archived at www.thekingcenter.org. His message of hope continues to live on in his letters. Perhaps, more importantly, his ideas continue to permeate our actions today and our dreams of a better tomorrow. 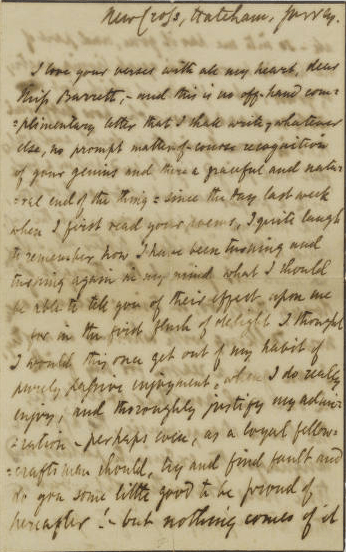 Robert Browning’s first letter to Elizabeth Barrett, dated 10 January 1845. Photo courtesy of Geni Blog (http://www.geni.com/blog/the-love-story-of-elizabeth-barrett-and-robert-browning-379330.html). In 2014, it may seem impossible to imagine that a romance can begin with a simple letter, but it is something that the Victorians certainly got right. The English poets Elizabeth Barrett and Robert Browning exchanged some 573 love letters over the duration of their courtship, which all began after Browning wrote Barrett a letter praising her poetry. Although Barrett was afflicted by a chronic illness, she and Browning continued to exchange letters, which allowed the two poets to gain a deeper understanding of one another. After their fifth month of correspondence, Barrett and Browning finally met face to face, but continued to explore their relationship through writing letters. In 1864, just over a year after they began corresponding, Barrett and Browning married and moved to Italy in an effort to alleviate Elizabeth’s illness in the country’s warmer climate. Barrett’s father, who wished her to never marry, disowned her after she ran away with her new husband. It was through their habitual letter writing that the two poets revealed their sentiments for one another, ultimately allowing their love to grow. Their souls were embedded in their handwriting, lying exposed for the other to see. They shared poetry and philosophy, sealing their devotion to one another upon the sealing of each envelope. For these poets, their letters acted as a means for them to plunge into the other’s world, to learn what it is like to be Elizabeth Barrett, to be Robert Browning. Their story, one that evolved through letters, is one that will continue to withstand time. As their eyes scrolled over each delicately written word, their intimacy blossomed into something that no one else in the world could touch. 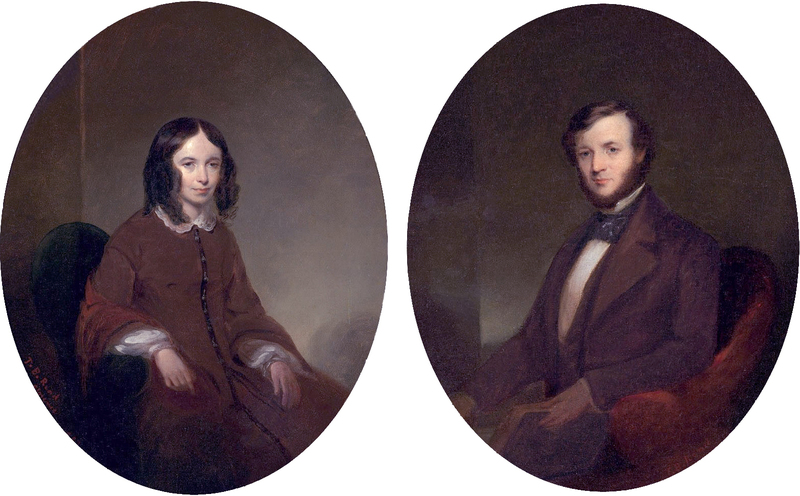 Portraits of Elizabeth Barrett and Robert Browning. Photo courtesy of Geni Blog (http://www.geni.com/blog/wp-content/uploads/2013/02/BarrettBrowning.jpg). The arrival of 2014 marks the advent of changes for many of us. As each new year approaches, we wade deeper into our marriage to technology, constantly checking our smart phones for text messages and emails with the tap of a finger. So I ask, what better time is there than now to reach for your favorite pen and stationery and write to someone you care about? It is undeniable that there is a personal touch embedded in the handwritten note that just can’t be replicated in emails. Share your wishes for good health and happiness with those who mean the most to you by leaping into 2014 on (or with) a positive note. Think about your own reasons for writing your note. The reasons to write to someone are endless and timeless, whether it’s to someone to thank her for a fun evening, a kind gesture, or a gift or to let someone know that you are thinking about her. Settle into your favorite spot before beginning to write. I personally enjoy lighting candles and turning on some calm music to collect my thoughts so I write something that is sincere and heartfelt. To add your own personal touch, use colorful adjectives to highlight your sentiments or memories of an experience—the more specific, the more heartfelt the note will be. 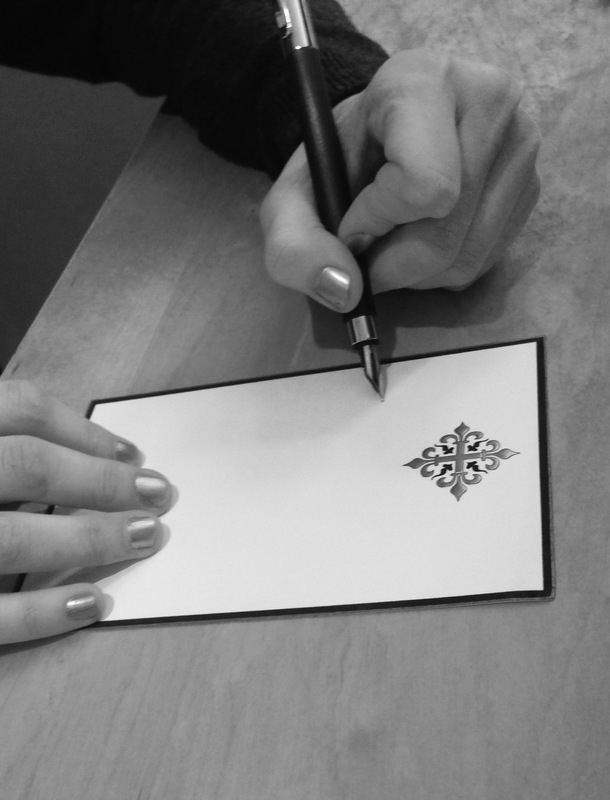 Sign your note in a way that will create a lasting effect on the person to whom you are sending it. Try something simple like Best wishes if you are writing to a close friend or opt for the classic Love for family members or a love interest. 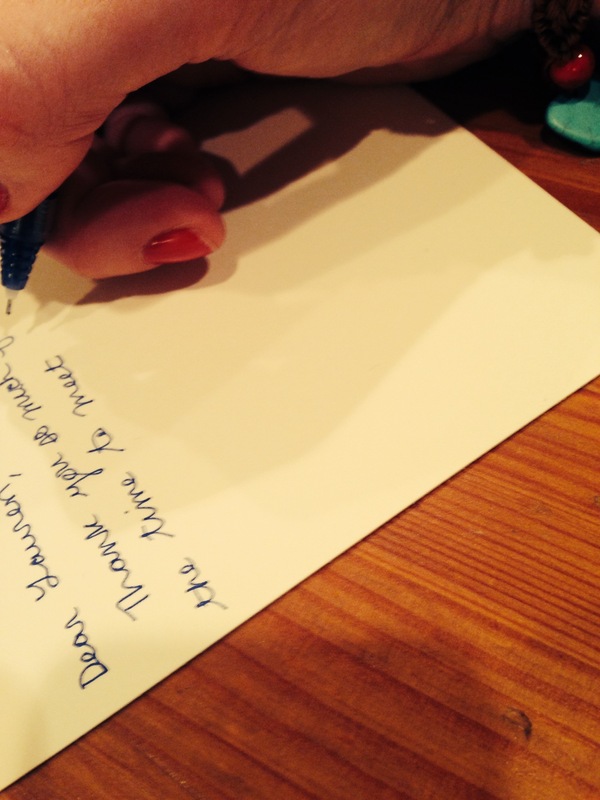 Remember that writing a note or letter means that you offer a tiny piece of yourself to the person to whom you write. The notes you send this year may very well become keepsakes, even mementos that can unlock the past in the years to come.